Tv and Movie Tuesdays consist of upcoming movies and tvs shows that must be seen! 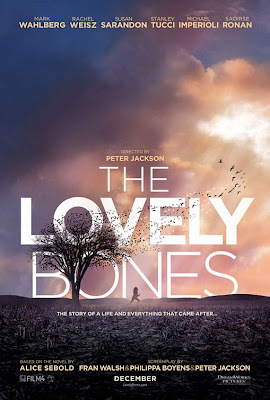 Summary: Based on the critically acclaimed best-selling novel by Alice Sebold, and directed by Oscar winner Peter Jackson from a screenplay by Jackson & Fran Walsh & Philippa Boyens, "The Lovely Bones" centers on a young girl who has been murdered and watches over her family – and her killer – from heaven. She must weigh her desire for vengeance against her desire for her family to heal. Oscar nominee Mark Wahlberg and Oscar winners Rachel Weisz and Susan Sarandon star along with Stanley Tucci, Michael Imperioli and Oscar nominee Saoirse Ronan. I think this movie sounds really good. I did not read the book though, have any of you?? The book was really good! Kinda strange, but very good and unique! The movie does sounds awesome, but I haven't read it either, I own it but haven't gotten around to it. But I did hear it was good. I've read some of the book and love it. I really want to finish it before the movie comes out. The movie looks visually stunning and is full of great actors. Last night I had a dream that Susie, the main character, was being held captive instead of murdered, and I helped find her. I think my subconscious is telling me to read the book asap and/or I just have anxiety about the violation of young girls.